Three of the five original works currently featured in the “Gallery Selections” and “minis” exhibitions at Sparks Gallery in the heart of the Gaslamp Quarter in downtown San Diego, California. Please contact the gallery for any questions at (619) 696-1614 | www.sparksgallery.com and visit the link below for purchasing information. 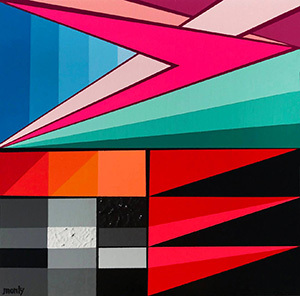 Statement: Monty Montgomery’s artistic vision can best be described as an emotional language created using his innate intuition about color and object relationships to connect with the viewer. This authentic viewpoint often humbly defies the norm giving his work both power and vulnerability. 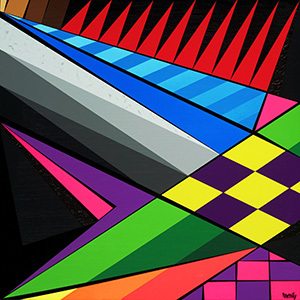 Exposure to divergent settings and combining urban sensory input with his impressions of the natural landscape has inspired a collision into one expression where he attempts through color, and geometric abstraction to share his artistic journey.